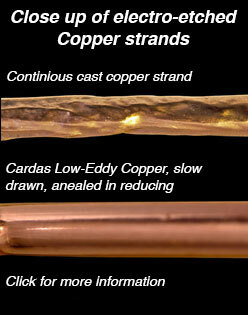 Cardas Audio provides high purity Copper and Silver stranding in many gauges, both coated & uncoated. We stock a variety of AWGs, both coated and un-coated (bare). Gauges that we have in stock can be purchased in amounts as small as 1 pound. Minimum orders apply to stranding that is not stocked. Cardas Copper & Silver stranding. Like many products, Cardas Fine wire developed out of a need that could not be filled. The availability of ultra pure, ultra soft conductor strand had decreased to the point of unavailability in this country in the mid eighties, due part to the development of and evolution of mass production techniques such as resistance annealing and mandatory recycling. Industrial copper was cheap and plentiful. However, super pure and ultra soft copper became unobtainable . The general condition of available copper became so bad that manufacturers began going off shore for product. Still, the consistency of product was poor and costs soon became astronomical, and we were forced to make our own. We found that care and consistency at every step of the drawing process and a bunch of nines after the decimal point were not enough. It made little sense to start with pure copper/silver just to have it harden and oxidize during the drawing process and after manufacture. Instead we developed a process where the copper is actually purified and super annealed during the drawing process and developed a coating process to protect the copper between steps and after production. At first our only customer we had was ourselves, and our livelihood depended on the perfection and purity of our metals. We are still our own best critic, we still make the most perfect product we know of, and absolutely do things the best way possible. We start with the best available copper on the market, ultra pure bar with 0 recycling content. We then, using our own proprietary process, draw and anneal the metal in a reduction atmosphere. Unlike conventional coppers that are quick annealed with an electric current process called "resistance annealing", our coppers are annealed the hard way, in hydrogen reduction ovens. Not just at the end of the drawing process, but at every step in the process in the ultra grades (Grade 1), and every other step in the super(Grade 2) . Custom diamond dies polish the wire as it is drawn, not just at the final step, but at every step in the process. At Cardas we use urethane enameled conductor for the construction of our cables. This is a very permanent protective process. A more affordable pure copper. This is basically very slow drawn ultra soft OFHC that is reduced and annealed between every other drawing step. This an ultra refined reduction drawn (H2 atmosphere) silver that is reduced and annealed between every drawing step. All conductor is available with any enamel coating, including low temp urethane, plain and formvar, heat and solvent bond-able coating, etc. We offer a unique wax (WX) coating that can be applied to bare copper to protect it and enhance cold pressure connections (like crimping). We also draw in other metals, such as gold, on request. Custom sizes or extreme specifications are welcomed. Our plant is unique and we are very resourceful -- We are one of the last of a species. As the bigger copper companies buy up all the small and mid-sized companies, product of this type be becomes unobtainium. 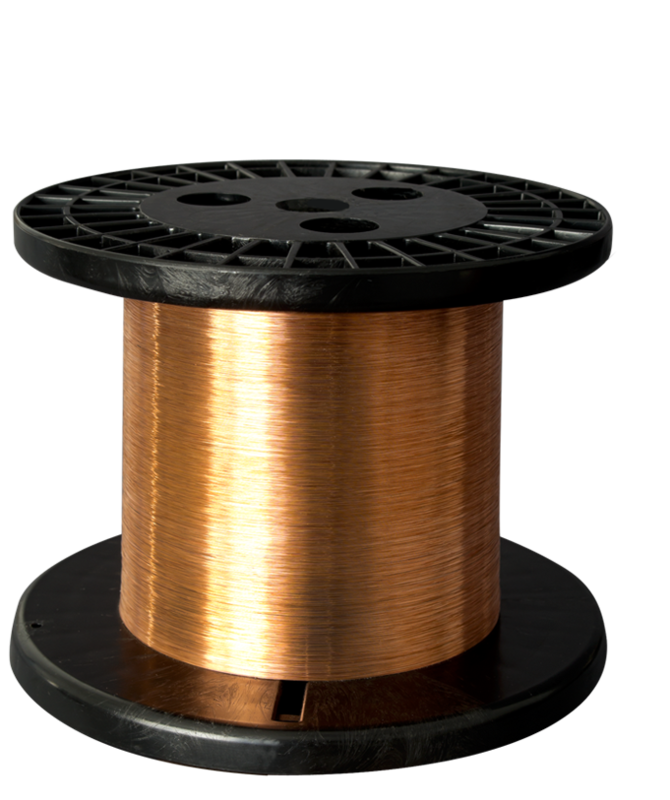 Chassis wire is multi-stranded copper, with a colored outer jacket. It is often used inside of speakers and electronic devices, such as amplifiers. Chassis wire is sold by the foot, and most gauges are in stock. Click here for our chassis wire page. 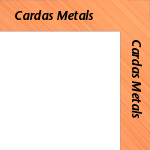 Copper and silver stranding (Cardas Metals) is just that - spooled up strands of pure copper or silver, available in various AWG's, coated or uncoated. Strands are used by customers making their own cables, or winding transformer coils. Stranding is sold by the pound, and lead times depend on the AWG. You are on the correct page for this product.